Thai cuisine provides such wonderful and harmonised flavours, a perfect balance of sweet, sour, salty and spicy taste in most Thai food. 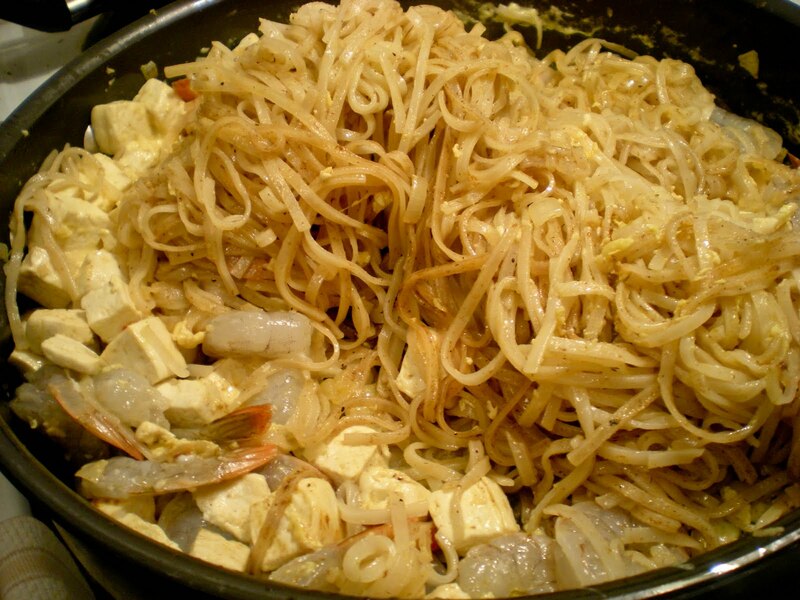 You must have seen pad thai in the menu of Thai restaurants and in fast food joints. It is no surprise that this dish is one of Thailand's national dish. Pad Thai is basically a rice noodle dish cooked in a bit of sugar, lime juice, fish sauce and chilli flakes. Some proteins are also added such as shrimps, eggs, cubed tofu or tempeh, chicken, and beef. A garnish of crushed peanut and coriander/parsley leaves are added to complete the dish. Pad thai is quick and easy to make, it is hard to mess it up. A good tip is to stir and toss constantly while cooking to prevent the noodles from sticking to the wok. You must have tried pad thai at least once, what would you put in your pad thai? 1. In a bowl, soak dry noodles in warm water until flexible but not expanded, about 5-10 mins. 2. In a wok or large skillet, heat oil over medium-high heat. Cook onions until transparent, tofu until brown. Add in garlic and cook until fragrant. 3. Drain noodles and toss into wok. Add in tamarind, sugar, fish sauce, and chili flakes. Stir constantly. 4. Push all noodles to one side of the wok. Add a tbsp of oil and pour in beaten eggs. Scramble until cooked and combine with noodles. 5. Add in shrimp and bean sprouts until fully cooked. Serve with a wedge of lime ans a sprinkle of parsley. I love Thai food too! The noodle shrimp stir-fry looks so delicious and appetizing! This looks simply appetizing! I love Thai food, especially the Tomyam soup! Thanks for stopping by my blog, that was real fast! Anything you cook will be delicious, and your mom will surely love it, especially when it was prepared with love, not every mom has a son to cook for them, espcially one as talented as you! Have a fun time with your mom! I love Thai food! Your Pad Thai looks so good! Now you went and did it, I have a craving for Pad Thai now! I was just looking at a Thai dish that I want to try. This sounds wonderful, Victor! My brother has a PhD in Asian studies specializing in Thailand. Before he married and moved to New Zealand he cooked lots of things that looked like this one! I hope you do well on your exams. When I took comps for my MA I was so stressed, but I passed the first time. I'm sure you'll be amazing. Mmm! Quick, easy AND Thai. That's a pretty winning combination. Thanks for sharing! Pad Thai is my wifes favorite and it's always with shrimp, I like combo dishes with chicken beef and shrimp!! I am fan of pad thai. Looks this one is fabulous recipe. this is one of my favorite thai cuisine...and you made it even more mouthwatering than the usual ones i have in restaurants! I adore thai food, my thai friend cooks amazing food for me....i just slowly staring to learn some cooking than just binge ....pad thai looks wonderful! 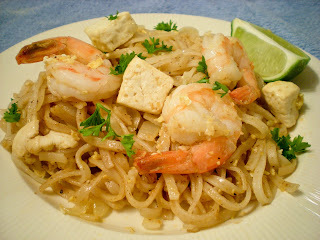 Am a big fan of thaifood.. your dish looks so delicious..
Love pad thai. Yours looks great! My favourite I must say is shrimp and chicken (because I am greedy) and I like lots of lime. Give me that irresistible pad thai,will finish it in no time,just love thai foods.. I just love this Thai food, I have tried this with chicken and shrimp but never with tofu your's look too delicious .. a must try! love the pad thai although i have yet to make it. you have given me inspiration! I love Pad Thai (shrimp, chicken whatever) and I almost always try Pad Thai when I go to a new Thai restaurant. I'm that serious about Pad Thai! :-) Yours look delicious and I'm going to try this recipe! Thank you for sharing! i do enjoy pad thai but have not tried cooking this yet. Looking at yours do make me feel like eating some now. If i were to make these, i will put in some seafood like prawns and squids and probably lots of peanuts! It looks really tasty! It's been a while since I've made pad thai, and now I'm craving it! hi! victor me and my family like to thaifood. thai food is so lite and aroma oh....no words. and i love veggi pad thai and ur version is looks just yummm...thnks for sharing this. Your Pad Thai look perfect. Not too oily and dry...just the right texture. I love pad thai, but I've never tried to make it! I recently visited Malaysia and I brought back a block of tamarind paste. Is this what you use in your recipe? Or do you make a syrup out of it? If you have any advice on how to use the paste, I'd love it. Thanks! Nice thought with this blog I enjoy studying and I conceive this website got some truly utilitarian stuff on it! This recipe for Pad Thai noodles is authentic and yummy.